Help your students practice answering who, what, where, when, and why questions with our favorite selection of Wh-Question Flashcards! Each deck features vivid imagery and guided activity instructions. 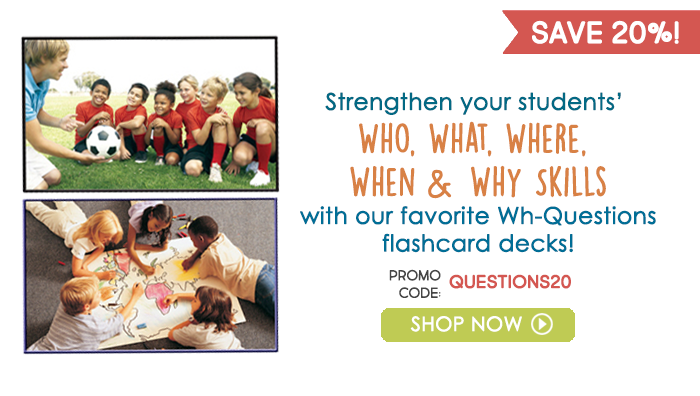 This week only, save 20% on your purchase of these select Wh-Question Flashcard Decks by using promo code QUESTIONS20 at checkout! Promotion expires 3/15/17 at 12:00am and applies only to items DRC 402, DRC 103, DRC 102, DRC 104, DRC 536, & DRC 113. Teach language and conversation skills to students with autism with these great books! This week, take 15% off any or all 3 of these great teacher guides and student workbooks. Use promo code LANGUAGE at check-out to redeem your savings. This workbook is great for a comprehensive coverage of Wh-Questions within various contexts. 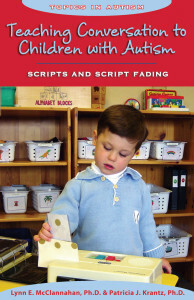 Teaching Conversation to Children with Autism Scripts and Script Fading provides step-by-step instructions to parents and teachers on how to teach conversation skills. Because many individuals with autism have difficulty initiating and maintaining conversation, this book describes how scripts and script fading can provide a predictable and meaningful structure for these individuals to engage in conversation. The goal is for these scripts to then progress to spontaneous language. This book covers: scripts for readers and non-readers; conversation activities; activity schedules; prompts and rewards; and observing, evaluating and measuring results. Teach Me Language is a social language manual for children with autism, Asperger’s syndrome, and related developmental disorders. Based on professional speech pathology methods, this book targets social language, general knowledge, grammar and syntax, functional knowledge, written expression and language-based academic concepts. 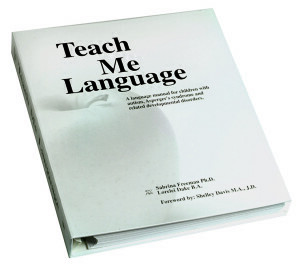 Teach Me Language is designed to take the child from one and two word utterances to more complex sentences that lay the foundation for social conversation. Don’t forget to use our promotional code LANGUAGE at check-out this week to save 15%* on any or all of these books for teaching language & conversation! *Offer is valid through March 22, 2016 at 11:59pm EST. Be sure there are no spaces or dashes in your code LANGUAGE at check-out! Call (800) 853-1057 with any inquiries. Encourage discussion and critical thinking in students with these decks of Wh- Question ConversaCards. This week, you can also save 15%* on your order of any or all of these sets. Just use promo code WHCARDS when you check out online or over the phone! C overing 6 different topics – Where Does It Go, What Happened, What Comes Next, What Do You Do With It, What Do You Need, and What Do You Like – each set comes with 54 cards and a Resource Guide containing helpful strategies and suggestions for prompts. Learning to respond to “what” and “where” questions is the foundation of conversation and expressive language. These flashcards can be used to teach sequencing, storytelling and logical thinking for a wide range of ability levels! Don’t forget to use our promo code WHCARDS to take 15% off* when you order your set(s) of Wh- Question ConversaCards this week! *Offer is valid through February 16, 2016. Be sure there are no spaces or dashes in your code WHCARDS at check-out! Call our customer service team at (800) 853-1057 with inquiries. Who works here? Why might they be laughing? When do you eat at the table? Use this set of 36 Wh- Question ColorCards and unlock opportunities to discover, understand, and practice Wh-questions. This week only, take 15%* off your set of the Wh- Question ColorCards; just use promo code WHCARDS at check-out! The ColorCards feature vivid photos of scenarios that allow for multiple opportunities to develop this key skill. These cards can be used in group or one-to-one settings, and come with a booklet with sample Wh- questions to ask for each of the images depicted. Don’t forget – you can save 15%* on your set of Wh- Question ColorCards this week only by using our promo code WHCARDS at check-out! *Offer is valid until 11:59pm EST on August 4th, 2015. Not compatible with any other offers. Be sure there are no spaces or dashes in your code at checkout! Help students improve their inferencing skills with these brand new inferencing cards we’ve just added to our catalog! This week, you can save 15%* on the Inferencing Quick Take Along! Mini Book or the WH Inference Question Cards by applying our promo code INFER15 at check-out! The pocket-sized Inferencing Quick Take Along! Mini Book is perfect for the busy speech-language pathologist, special educator, teacher, or parent. Help students practice their inferencing skills by responding to 520 prompts in 13 different categories covering: Actions, Categories, Cloze Sentences, Context Clues, Descriptive Clues, Emotions, Locations, Naming Tools & Devices, Occupations & Jobs, Problems & Solutions, Pronoun Antecedents, and Time & Seasons. This small 5″ x 3″ book is spiral-bound, so you can easily flip pages and keep it open to the page you’re working on. The sturdy, laminated pages are tear-resistant and easy-to-read. Includes an Answer Key. WH Inference Question Cards is a robust set of five card decks ideal for helping students reach the next stage of Wh-development, once they have mastered the basics. Each deck contains 56 double-sided cards that provide clues and hints to answer various Wh- questions. Side A has a colorful picture and a Wh-question (“Why is Karla waving?”). This picture provides clues that the children must use to infer the correct answer. Side B has a second, related picture and the answer (“She is going on a trip”). The durable tin comes with 5 decks for Who?, What?, When?, Where?, and Why? Questions, each on a long-lasting metal ring for convenient use and storage. Leave the cards on the color-coded rings as you teach, or easily remove them as needed. Each of the 56 cards in the five decks measures 2½” x 3½”. Don’t forget – you can take 15% off* either or both of these inferencing card sets by using our promo code INFER15 at check-out this week! *Offer is valid until 11:59pm EST on February 24th, 2015. Not compatible with any other offers. Be sure there are no spaces or dashes in your code at check out!